In poor areas, the demand for safety requires creativity. In the absence of money, resources and technology, and in the face of violent crime quite unlike that which is seen in the suburbs, community policing takes on many forms. Taxi associations, street committees and vigilante groups are some of the common informal initiatives in a spectrum of responses to crime that have characterised communities besieged by violence, substance addiction and socio-economic stagnation. By DANIEL HARTFORD. Last weekend’s fatal shooting of former Mongrels hitman, Nadeen Lindsay, in Ottery sparked a surge in gang violence on the Cape Flats, and again reiterates the magnitude of the gang crisis in the Province. Operation Combat, the operationalization of the 2011 South African Police Service (SAPS) Gang Strategy, is the sharp end of the police spear in responding to gangsterism and gang violence. The strategy is expressed by four key pillars of which “Community Mobilisation Towards Development” is the third, and commits to the development of “social crime prevention programs,” “focused community mobilisation against identified targets/areas” and the “creation of broad mobilisation forums against gangsterism and drugs at station level.” Community Police Forums (CPFs), Neighbourhood Watches (NHWs), Business Watches and School Safety Programmes are the vehicles of community mobilisation. Dan Plato, Western Cape Minister of Community Safety, criticized the strategy in 2014 for “look[ing] good on paper,” stressing that it is, “extremely worrying that the provincial SAPS management is calling on greater community mobilisation without a more detailed plan, or communication strategy for how communities should mobilise themselves within the confines of the law.” While Plato’s own attempts in 2012 – conducting walkabouts in Lavender Hill and hobnobbing with gang bosses – received scathing criticism, his analysis is not without merit. Certainly, community partnership structures exist in neighbourhoods besieged by gangsterism, and drug addiction, however police reciprocity in this relationship is rare at best. In the absence of police support, communities have begun to organise themselves. “I want to bring lavender back to the hills,” says Lucinda, a resident of Southern Hills in Lavender Hill. Lucinda is the charismatic leader behind Southern Eye Neighbourhood Watch (NHW), which formed in April this year after she chased a would-be thief down the street with a sjambok. It is in the context of powerlessness and frustration that NHWs are on the rise in the Cape Flats as “enough is enough” and the need to “take back our streets” become common refrains. While SAPS has appealed for help with South Africa’s crime crisis, claiming they “can’t do it alone,” in the gap left unpoliced, communities have (and always have) sought their own solutions to their safety needs. These are achieved in different ways. In affluent suburbs, the demand for safety is met by kevlar coated ADT soldiers who interrogate and never respond late. “Improvement Districts,” private security and well-resourced NHWs form the bulk of the bulwark against crime. With top of the range technology, number plate recognition cameras monitoring entries and exists radio communication, frequent patrols and a splash of racial profiling, most NHWs in affluent neighbourhoods have seen a decrease in crime specific to their areas, namely: robbery, armed robbery, theft and motor vehicle related theft. The only crime probably increasing is contact crime like assault but this is a story for another time. In poor areas, the demand for safety requires creativity. In the absence of money, resources and technology, and in the face of violent crime quite unlike that which is seen in the suburbs, community policing takes on many forms. Taxi associations, street committees and vigilante groups are some of the common informal initiatives in a spectrum of responses to crime that have characterised communities besieged by violence, substance addiction and socio-economic stagnation. The type of justice dispensed fluctuates, too, as community frustration with crime could lead to a mob attack and the death of a cell phone thief in one instance, while a known perpetrator of sexual violence is left unchallenged, or even lauded by some, in another. Over and above police efforts, The City of Cape Town (CoCT) has launched its own initiatives in an attempt to stem the violence. City initiatives include Violence Prevention through Urban Upgrading (VPUU), which develops the built environment to create safer spaces; Neighbourhood Safety Officers utilising a “broken windows” approach as they offer embedded, integrated and alternative “softer” policing services to some communities, and the Ceasefire project, which, through conflict mediation conducted by ex-gangsters, pathologises violence, “interrupting” the spread of disease. The merits of these initiatives aside, they are isolated pilot projects whose combined efforts fall far short of a comprehensive plan in the face of gang violence in the province. The Western Cape Government’s Department of Community Safety (DOCS) is under no illusions about the scale of the task as they attempt to breathe life into the same notion of “community partnerships” employed by SAPS. If the latter’s efforts fall short, the city and provincial initiatives have a lot more to do if they are to help float a sinking boat. In the absence of an effective and comprehensive community safety strategy amidst violent crime and gangsterism, communities are increasingly developing their own safety solutions in their neighbourhoods. This organic phenomenon, over and above anger and frustration, is fuelled by a wary cynicism for the criminal justice system and is incubated by an absent, security providing, authority. While efforts are made by DOCS and the CoCT to register, train, equip and centralise the operations of NHW structures in poor communities, by-and-large, the opinion of residents is that these role-players have short attention spans, and are often absent from the conversation. In instances where they are involved, residents complain that they have not received all the equipment they were promised, and the respective training modules offered by each are hardly sufficient. The exceptional political stalemate that characterises relations between the DOCS and the SAPS in the Western Cape does not aid matters. Meetings between CPFs and Joint NHW Forums with nationally deployed Station Commanders towing an ANC line grind to a halt in DA constituencies. The political fault-line that characterises discussions about community safety in the province is a real impediment to a working relationship between stakeholders and the delivery of safety provisions there. Enter Lucinda and Southern Eye NHW. Their ascent has been nothing short of meteoric. The 45-strong group, with equal numbers of men and women started with simple patrols in April this year, and have since grown their activities to include weekly “OppieKoffies” where neighbours chat and debrief. Social events double as awareness campaigns stressing Gender-Based Violence advocacy and individual rights. Play dates with children in drug-peddling hot spots interrupt the gangster’s trade, and some members of the group have been trained in trauma counselling and crime scene management. Theirs would appear to be crime’s unlikely success story as they organise to reclaim their neighbourhood amid constant violence, soaring drug addiction and with very little financial support. Fortunately for Southern Eye, they enjoy a close relationship with some members of Steenberg SAPS, who have assisted them on patrols and respond promptly to their calls and Whatsapps. However, other NHWs in Lavender Hill do not enjoy the same proximity to SAPS and cannot boast the same success. Thunderbolt, a NHW established by Aisha Davids and run almost entirely by women, is no longer actively operating following the death of a member last year. Lighting fires in oil drums on street corners, the women stood vigil in the dark hours of the night confronting groups of young men. Some days after being threatened by a gangster, one of Thunderbolt’s members was shot dead, and the NHW was forced to take their activities off the streets. The comparison that Thunderbolt is a gang of sorts for contesting turf and opposing gangsters elicits a short laugh from Aisha. “We used to joke that we were ‘the corner girls’,” she says referencing the notorious Corner Boys gang in the area. Supreme is another NHW in Lavender Hill that does not shy away from a comparison with gangs. Established in June of this year, they have enjoyed some support from Lucinda’s Southern Eye, but have, for the most part, struggled alone in some of the more violent areas in the community. Chairman, Stephen, grimaces as he acknowledges how in the past Supreme had “sorted it out the wrong way.” Comprised of 10 women and 7 men with the youngest member aged 12, the group patrols areas known for shooting and drug peddling with bats and golf clubs. While acknowledging that violence was regrettably used by the NHW in the past, Stephen still feels that firearm training would benefit Supreme’s activities in the future. Lucinda asks the question, “How do you operate within the law and enforce the law?” Tragically, for NHWs on the fringes who face an onslaught of violent, gang related crime and a dearth of policing, this is just one of many unfair questions they are forced to provide their own solutions to. 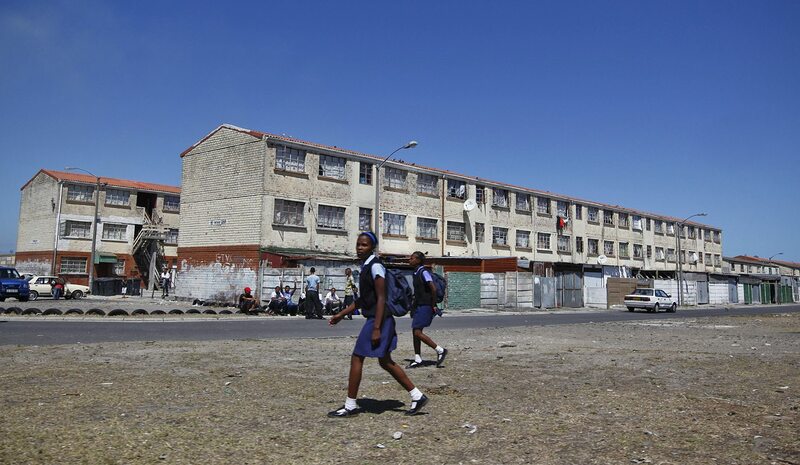 Photo: School girls walk past two blocks of flats on the Cape Flats in Hanover Park, Cape Town, South Africa 13 February 2012. EPA/NIC BOTHMA.